Hamburgers, hotdogs ‘n’ Happy Days. The Italian and I had gone walkabout looking for interesting food places. Lindi, The Italian’s main squeeze, had tagged along with us. Lunchtime found us in Soho, with a million possibilities, food from all over the world, but somehow it felt like a hamburger kind of day. Which was great, because we were only a hop and a skip from Ed’s Easy Diner on Old Compton Street. I always like going to Ed’s. 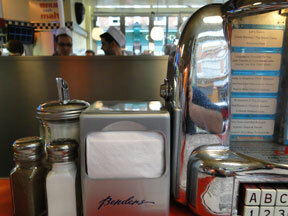 It’s 1950s American kitsch; eating there’s like hanging out in Happy Days. If Richie Cunningham and The Fonz walked through the door they wouldn’t look out of place. We perched on our barstools watching our burgers being flipped, and reading the cheesy slogans on the walls – In Ed’s We Trust, If It Don’t Make You Proud Don’t Serve It To The Crowd, Takeouts Are Fine But Please Leave The Tables. Lindi popped a 20p piece in the jukebox, Bill Haley and the Comets, Shake, Rattle and Roll – good choice. I had my usual, The Classic, a burger topped with griddled onions, and the Regular Fries. The Italian went for the Big Bubba, (it is what it sounds), with the Chilli Cheese Fries, deciding, wisely I thought, that the Bacon and Cheese Fries might be overdoing it. Lindi opted for the Classic Dog, a juicy, meaty hot dog smothered with griddled onions, not easy to eat and remain ladylike at the same time but she done good. If your ideal meal is a burger made from prime beef, Atomic American Fries (they come with jalapeno jelly, chilli, sour cream, cheddar cheese sauce and guacamole on the side), and a banana and peanut butter milkshake, this is the place. If you’re watching your waistline, it probably isn’t.